I’ve always been a little nuts about insects. The earliest memories of lying across our front walkway under a hot Virginia sun, sharing my lunch with a multitude of ants that lived between the bricks may have launched the budding citizen scientist in me. Observing ants of all colors, shapes, sizes and behaviors intrigued me and led me to a multitude of other insects. That inquisitive little girl has aged into an inquisitive old girl who is still intrigued by insects. 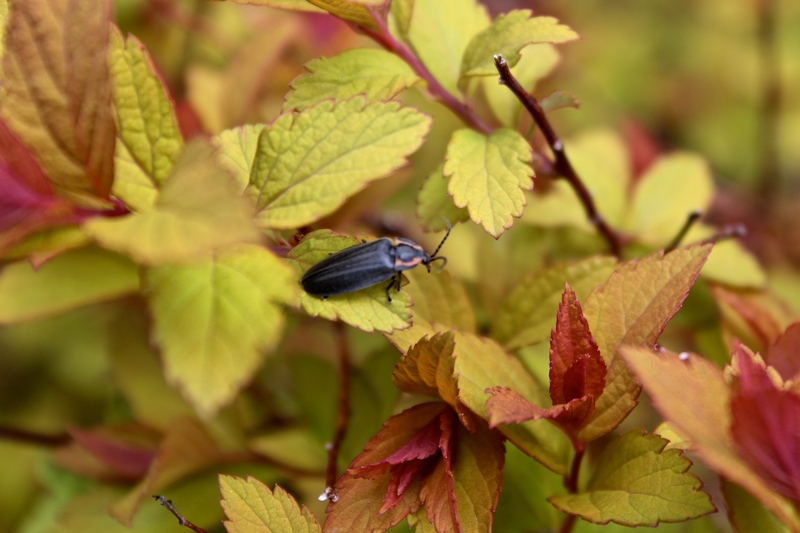 Here’s an early spring insect resting on my dwarf spiraea japonica. I’ve seen them a few times on cold spring days in New England as they are the first of this family to emerge from hibernation, often in freezing temperatures. If this fella reminds you of a lightning bug (locals say ‘firefly’), you are right. It’s in the same family, yet it doesn’t look exactly like those we see on summer nights dancing and flickering their lights over lawns and the edges of woods. Although the middle sections are outlined with bright orange bands, the difference is in these wings, which are a dull black. 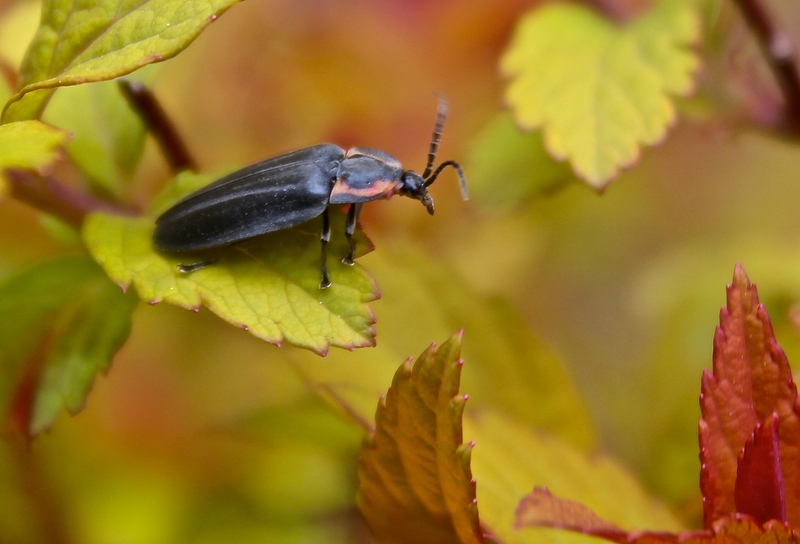 The Winter Firefly (Ellychnia corrusca) is related to our familiar lightning bugs. It glows as a larva, but lacks the light organs as an adult. And it is active during the daytime instead of night. Maple syrup producers are familiar with this gentle pest. It dines on the fluid of maples and what better meal than a bucket of sap on the side of a maple tree…. where they often perish in the liquid. Click HERE to visit a virtual habitat to learn about three groups of flashing lightning bugs in New England. 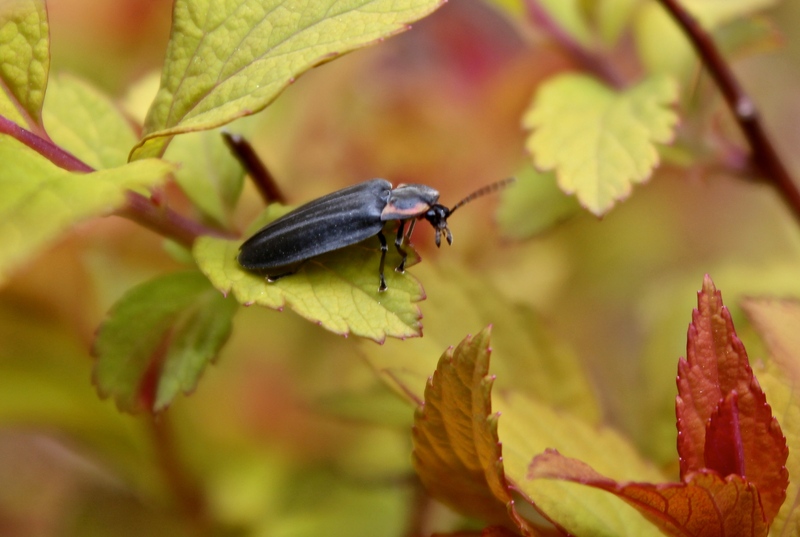 This entry was posted in Nature, New Hampshire and tagged Ellychnia corrusca, insects, Lightning bug, nature, New England, Winter Firefly by Annie. Bookmark the permalink. Fantastic timing — I just came across one of these guys hanging out in the garlic, and wondered what it was! How cool. I hope he was hanging out looking for a mate and not sampling the wares. Unreal, but in Virginia we have already see just a few lightning bugs already. Isn’t it a little early for that? It seems really early but the time varies by one or two weeks every year. Enjoy! I miss my Virginia friends, too!!! Maybe it’s time for a visit?